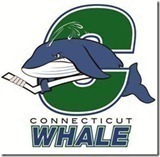 The Connecticut Whale should be happy they came away with the two points they got for the 5-3 win Sunday afternoon in Manchester when they faced the Monarchs at the Verizon Wireless Arena, because they certainly weren’t going to be getting any style points – if there was such a thing. Despite going into the game with a 3-0 record against the Monarchs this season, the Whale were minus arguably their best all-around player as Mats Zuccarello was recalled by the New York Rangers after Ryan Callahan’s nagging foot injury sustained when he blocked a Ilya Kovalchuk shot, was unable to go. According to Andrew Gross on his Ranger Rants blog, Zuccarello found out about his recall on Sunday morning. ““I was eating breakfast, getting ready to go to the game in Manchester. I packed my little stuff and go the airport.” Zuccarello was sent to the Whale after the third game of the season against the New York Islanders at Nassau Coliseum. So the Whale were going to need to press on without “The Norwegian Hobbit.” In his absence, Ryan Bourque moved up from the third line with Tommy Grant and Kelsey Tessier to the second with Wellman and Andreas Thuresson while Jonathan Audy-Marchessault moved up to the left wing on the first line. Gernander also inserted defenseman Blake Parlett into the lineup for his first game with the Whale as a forward running with Jordan Owens and Jeff Prough. The first period was played fast and wide open with both teams putting two in the net of the opposition. The Whale struck first when Wellman put his first of two past Jeff Zatkoff (17-14-1, 27 saves). Thuresson took the puck form behind the Manchester goal and threw it up to the left point and to the stick of Brendan Bell. The Whale defenseman then fired a slap shot that hit the goaltender in the pillows and rebounded to Wellman on the right side before slamming it into the back of the net at 1:14. Two seconds short of three minutes later Richard Clune redirected a David Kolomatis shot from the right point and snuck it past a stellar, again, Chad Johnson (20-13-5, 34 saves), knotting the score. Eleven seconds later Grant took a hooking call and on their first power play just sixteen seconds into that man-advantage Kolomatis got his second helper when he gave the puck to veteran Trent Hunter who walked the puck out form the left half-boards untouched and ripped a wrister that beat Johnson glove-side making it two goals in 27 seconds and a 2-1 lead. The Whale responded with a power play of their own at 12:26. Nick Deslauriers went to the box on a roughing call at 11:56. As the puck moved around the perimeter, Audy-Marchessault on the left side sent the puck to the right point and Tim Erixon. The future Ranger fed Kris Newbury in the right circle. Newbury looked across and saw Audy-Marchessault sneaking in on the left side. A perfect cross ice pass and an even better shot over the short side shoulder and under the crossbar later the score was tied at two. The best scoring chance for either team in the second period came in the first half minute. Zatkoff misplayed a puck behind the net and it bounced of the boards, hit the cage and came right out in front of the empty net. Audy-Marchessault turned on the after burners to get to the puck and take the gift goal. He looked golden until Jake Muzzan dove across the crease and got his stick on the puck sending Audy-Marchessault’s shot over the top of the net. Manchester outshot the Whale 11-6 in the second period, but it was all Whale in the third as the connected three times to pull away. The first came at 8:09. Linden Vey’s outlet pass from the right side, and just inside their defensive zone hit Bourque and flipped right to Wellman. The Brentwood, California native blasted the puck past Zatkoff for his twentieth of the season. Wellman potting twenty was the first time in his professional career. Eleven seconds later Marc-Andre Cliché’s shot from the left wing faceoff circle blew right past Johnson. The goal was washed out when Clune, who was battling Jared Nightingale in the crease fell on Johnson and referees Chris Cozzan and Jon McIsaac discussed it and called off the goal. Exactly three minutes later Grant sent an outlet pass up to Wellman. The versatile forward raced up left-wing and fed Thuresson on the right side of the slot. Thuresson’s slapper beat Zatkoff over the glove for what would prove to be the game winner. Two goals were scored in the last 1:51. At 18:09, with Zatkoff on the bench and an extra attacker on the ice, Thomas Hickey blasted a shot from the high slot as Brandon Kozun put up a perfect screen so that Johnson never saw the shot from the the Monarch defenseman making it 4-3. But the Whale’s new captain, Wade Redden aced the game when his clearing attempt off the wall from deep in the Whale zone. Kozun chased the slow rolling puck back to the net, but could not catch up to what proved to be Redden’s second goal since returning from a two month absence, the longest of his career. 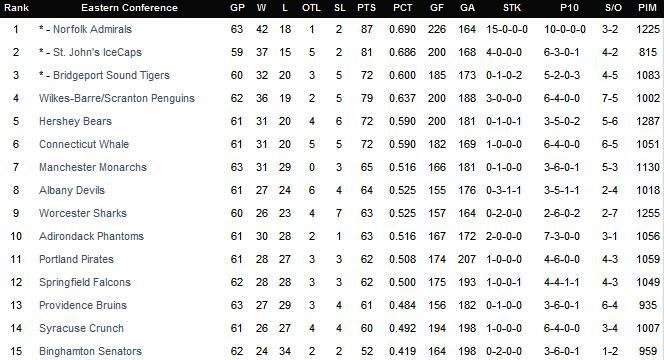 With Bridgeport having lost to Norfolk 6-3 at the Webster Bank Arena the Whale find themselves in a first place tie. Bridgeport still sits atop the Northeast Division by means of holding a game in hand on their intra-state rivals. The two teams will battle it out for first place at the XL Center on Friday night at 7pm. Ian Clark with the story inside the Monarch’s dressing room at UnionLeader.com. * Such a great honor for a great man, so we’ll rerun the link on Ken Gernander being inducted into the Connecticut Hockey Hall-Of-Fame at TheAHL.com. Some much needed rest for the #CTWhale as they are off now until next Friday when they do three-in-three again, but all at home. 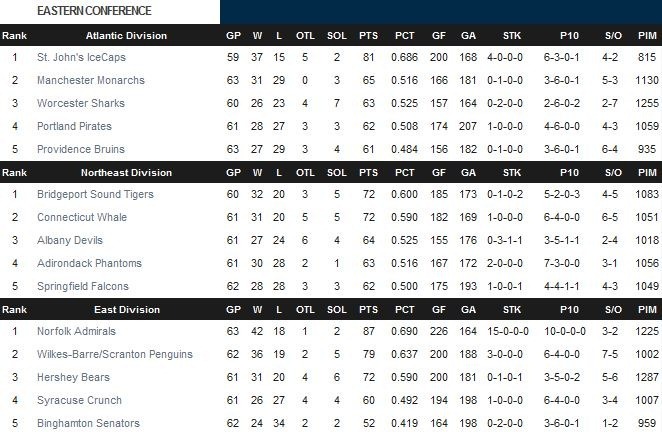 Of the team’s remaining 15 games, ten of them are at home and only one of them requires a road trip and that’s the first weekend in April when they travel to Wilkes-Barre and Hershey. You can hear all the action on WCCC.com starting at 2:50pm. For Ticket information for all home games, call (860) 548-2000. Too far away or can’t make it? Listen live at WCCC.com or from your cell phone or computer you can get all the live action via our Twitter page:@HowlingsToday for all games both home and away. 1st Period-1, Connecticut, Wellman 19 (Bell, Thuresson), 1:14. 2, Manchester, Clune 5 (Kolomatis, Loktionov), 4:12. 3, Manchester, Hunter 2 (Kolomatis, Azevedo), 4:39 (PP). 4, Connecticut, Audy-Marchessault 20 (Newbury, Erixon), 12:26 (PP). Penalties-Grant Ct (hooking), 4:23; Bourque Ct (tripping), 8:56; Deslauriers Mch (roughing), 11:56; Clune Mch (tripping), 14:30; Loktionov Mch (high-sticking), 15:20. 2nd Period– No Scoring.Penalties-served by Kozun Mch (bench minor – too many men), 10:36; Owens Ct (tripping), 13:48. 3rd Period-5, Connecticut, Wellman 20 (Bourque), 8:09. 6, Connecticut, Thuresson 13 (Wellman, Grant), 11:20. 7, Manchester, Hickey 3 (Mullen, Vey), 18:09. 8, Connecticut, Redden 2 18:58 (EN). Penalties-Deveaux Ct (holding), 12:48. Shots on Goal-Connecticut 13-6-13-32. Manchester 16-11-10-37. Power Play Opportunities-Connecticut 1 / 4; Manchester 1 / 4. Goalies-Connecticut, Johnson 20-13-5 (37 shots-34 saves). Manchester, Zatkoff 17-14-1 (31 shots-27 saves). Referees-Chris Cozzan (18), Jon McIsaac (39). Linesmen-Joe Ross (92), Brian MacDonald (72). This entry was posted in AHL, Connecticut Whale, CTWhale, Hartford Wolf Pack, Hockey, New York Rangers, NHL, Sports and tagged Andreas Thuresson, Audy-Marchessault, Blake Parlett, Casey Wellman, Chad Johnson, Connecticut Whale, CTWhale, Jeff Prough, Jeff Zatkoff, Johnson, Jonathan Audy-Marchessault, Jordan Owens, Kelsey Tessier, Ken Gernander, Kris Newbury, Manchester, Mats Zuccarello, New York Islanders, New York Ranger, Ryan Bourque, Ryan Callahan, Tommy Grant, Wade Redden, Whale. Bookmark the permalink.